Virgin paper towels and conventional electric hand dryers have damaging effects on the environment. Paper production consumes precious non-renewable resources as well as contributing to a deforestation rate of roughly 13 million hectares per year. Furthermore, paper towels cannot be recycled and end up in landfill. 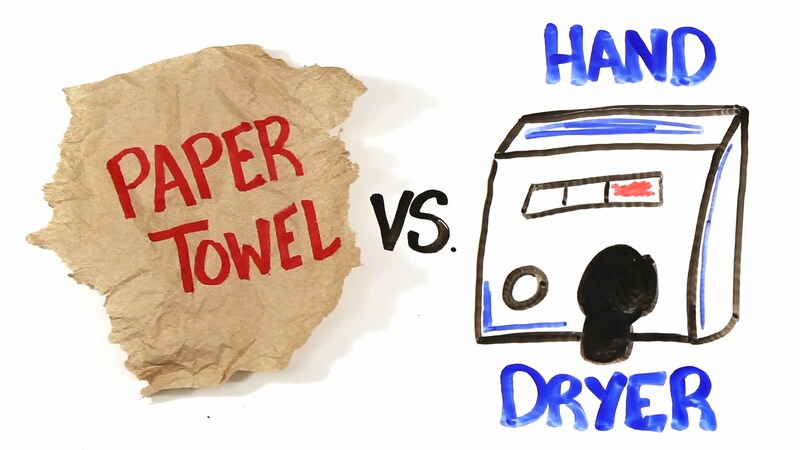 A study comparing these two methods of drying concluded that both the conventional hand dryer and the paper towel performed almost exactly the same, environmentally speaking. This is because you are using fossil fuels to generate the energy needed to create both the hand dryer as well as to produce paper towels. However, powerful ‘High Speed’ electric hand dryers, with fast 12-15 second dry times are up to 80% more energy efficient than standard hand dryers. Combined with a lower power rating (around 1.5 kilowatts compared to 2.4kilowatts) these ‘High Speed’ dryers can reduce the carbon footprint by 50-75%. A 2008 case study, of Maribyrnong City Council showed the positive effects of switching from paper towels to high speed hand dryers. Eliminating the need for their yearly use of 1.5 tonnes of paper towels saves an estimated $26,700, 40,000 litres of water, and reduces their CO2 emissions by 2.6 tonnes per year! When comparing energy efficiency, virgin paper towels use roughly 743 energy kilojoules per use. Paper towels that are 100% recycled content use roughly 450 energy kilojoules. A standard electric dryer comes in at just over 220 kilojoules. A high speed, low wattage hand dryer leads the way with roughly 80 kilojoules a use. One Envirocare dryer comes in at only 76 kilojoules a use! It’s time to throw in the towel. A Massachusetts Institute of Technology (MIT) study that compared high speed electric hand dryers to conventional dryers and paper towels, compared the shorter drying times and wattages, as well as the impacts associated with generating and using electricity with the impacts and emissions related to paper production, manufacturing and disposal, and found that high speed dryers come out on top. This result even held when fewer than two paper towels per dry were used and even with 100% recycled paper. Call us today on 1300 557 987 to get more information on our complete range of high speed electric hand dryers to suit any budget!